U.S. Secretary of State Mike Pompeo is in the Middle East for regional security talks in Kuwait, Israel and Lebanon as Washington looks to draw new support in its opposition to Iranian aggression. The top U.S. diplomat arrived Wednesday in Kuwait City, where he said he plans to discuss U.S. strategic plans in the region and energy issues with Kuwaiti officials. After Kuwait, Pompeo will travel to Israel and meet with Prime Minister Benjamin Netanyahu, whose government is headed to a tough April 9 re-election contest as Netanyahu is embroiled in a corruption investigation and facing allegations of bribery, fraud and breach of trust. The United States considers Hezbollah, a militant Islamist political group, as a pro-Iranian “terrorist” organization, even though it is represented in the coalition government of Prime Minister Saad Hariri, a U.S. ally. 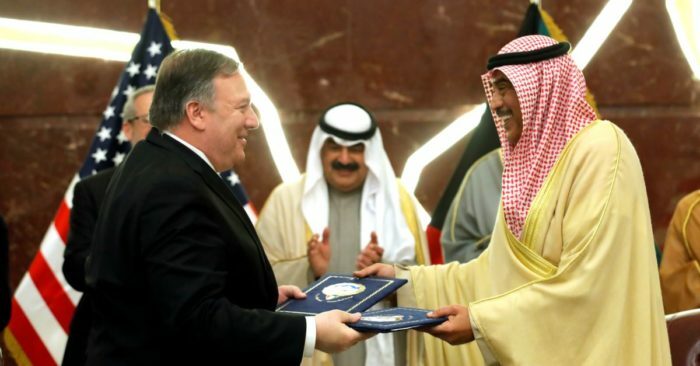 Tags:Middle East Iran Mike Pompeo Kuwait Categories: U.S.